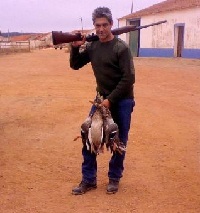 Portugal, the mostly unknown hunting country, is a true paradise for hunters. Shooting has a century-old tradition here. In Portugal, the hunt is very easily combined with a cultural sight-seeing-trip or a bathing holiday. Why not join together holidays in the sun with a wild boar shoot? Spend the day at the beach, enjoying our services and go hunting in the evenings. Once the grain is ripe, the boars are attracted to the fields. During this time, raised stand hunts are very promising. Raised stand hunts: All year, 5 days before and after full moon. 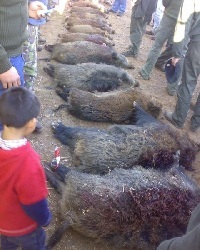 Wild boars will be pursued by "Montaria" (drive with about 200-250 dogs and 50-60 hunters on raised stands). Season of Montaria from October to February. Partidges and Pheasants will also be hunted by drive. Wild ducks will pass the beat in twilight. They can be hunted from November to January. There are small predators that may be shot - Foxes and mongooses. Hares need wild herbs for their nutrition - in times of intense farming quite a problem, but not in the Alentejo. 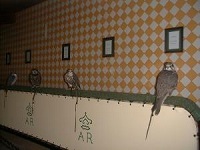 The aim of falconry is the harmonic coordination of raptor, falconer and dog. While the dog has to find and scare up the game, it is the falconers concern to get the bird in a good position. It is the falcons decision, when the hunt begins, and the course depends on strength, dexterity and endurance of both the raptor and prey. The preferred prey of the hawks are rabbits, hares, pheasants, ducks and pigeons. The peregrine falcon hunts pheasants, partridges and ducks, whereas the golden eagle is used for hares and foxes.